Dr. Randy Prestash from Oconomowoc, Wisconsin owns two of the seldom seen Speedsters from the Classic Factory. Check out the latest Photo Gallery to see Randy's other Auburn Speedsters. Do you recognize the background... You should. It is the historical Court House in downtown Auburn, Indiana, "The Home of the Classics"
It is hard to find good help theses days. 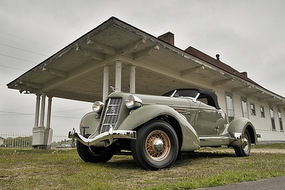 This Auburn Speedster is a 1936 852 model. 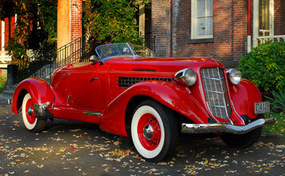 It was recently offered at auction in Monterey, California through Mecum Auctions! 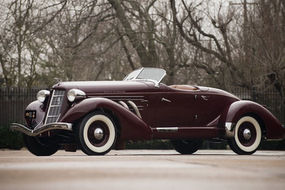 A 2007 AACA Senior 1st Place Winner and was Presented at Pebble Beach in 2006. 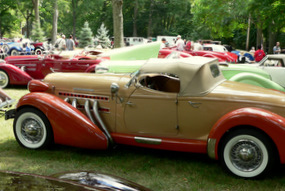 I was fortunate enough to see this car at the AACA's 2009 National Meet in Hershey. 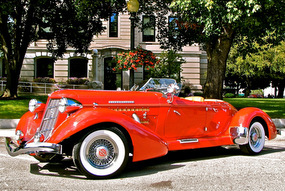 For more photo's "Click Here"
This Beautiful Speedster belongs to a friend, Harry Floyd, from Shelbill, Indiana. Harry is a True Craftsman. 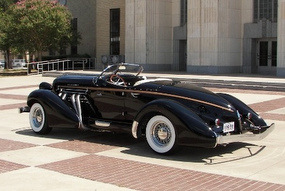 He totally rebuilt this Elegant Motors Speedster using many of his own fabricated parts in the build. Check out his Fender Shirts (metal), Wind Wings and Stone Guard for the Grill. Great Car Harry!